This weevil (family Curculionidae) was one of just a few beetle species that I encountered earlier this month in Buenos Aires, Argentina at La Reserva Ecológica Costanera Sur. Weevils are, of course, one of the most taxonomically diverse and difficult groups of Coleoptera, making species IDs based purely on photographs quite challenging. Nevertheless, I am reasonably confident that this individual represents Naupactus xanthographus, or the South American fruit tree weevil. This name, it seems, has also been applied to a variety of other weevils photographed in South America and posted on the web, but the images I found at a few seemingly more authoratative sites give me confidence that this is the true N. xanthographus. The narrow form suggests this individual is a male. 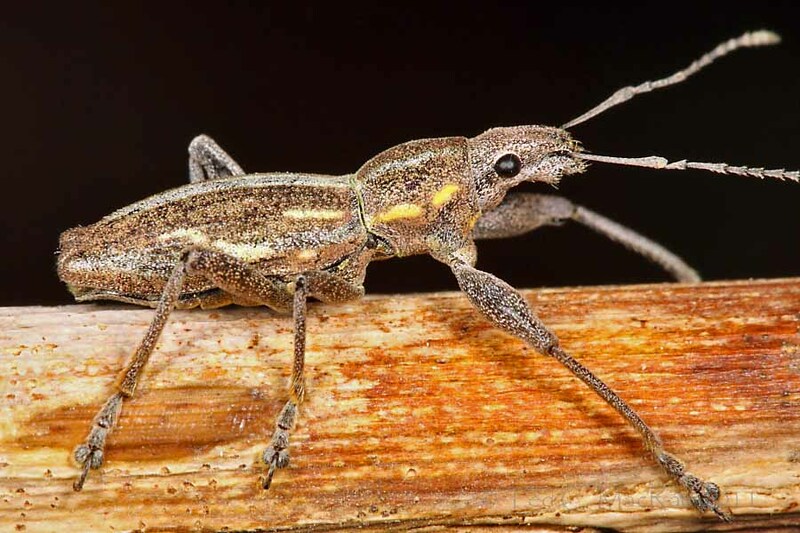 The genus, known collectively as “white-fringed weevils” is a large genus of exclusively Neotropical species – several of which have been introduced to North America (e.g., N. cervinus, Fuller rose beetle, and N. leucoloma) and which were, until recently, placed in a separate genus Graphognathus (Lanteri and Marvaldi 1995) (apparently the reduced humeri and lack of metathoracic wings were deemed insufficient for generic distinction). In South America some of the species have become pests as well, with N. xanthographus becoming a problem for growers of grapes and other fruits and, thus, earning the names “burrito de la vid” (Chile) and “mulita de la vid” (Argentina) (both roughly translating to “grapevine little donkey”). This was not an easy photograph to get – I found the weevil clinging to the underside of a leaf above my head. It was impossible to photograph it in situ, so I moved it to a low twig away from other foliage where I could get the black background I desired. 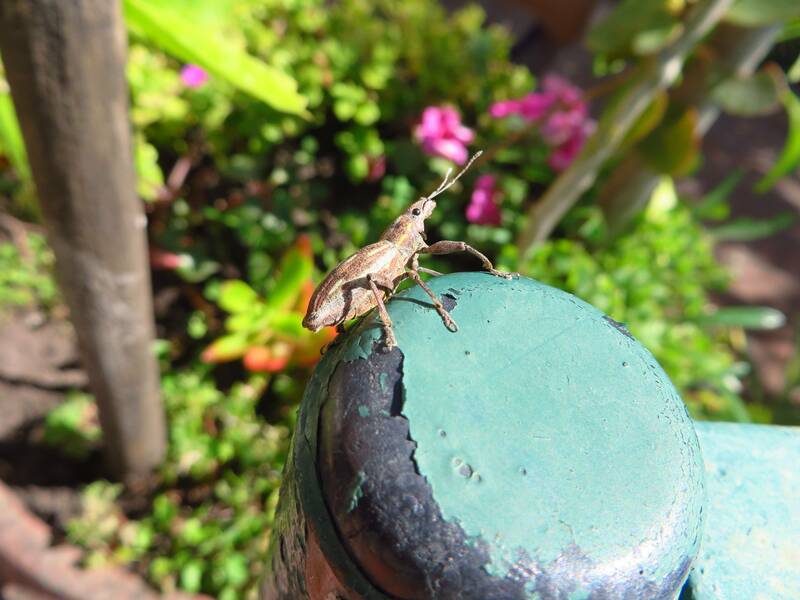 Once moved, however, the weevil just never… stopped… crawling. Snapping shots of an actively crawling insect is a crap shoot at best – not only are focus and framing more difficult to nail, but subjects photographed while moving almost always have one or two “bum” legs (lifted or cocked out of position). A number of attempts were required to get a photo I was happy with (save for the slightly clipped antennal tip). In such situations, I’ve found it best to track the beetle as it moves and as soon as the center focus point of the lens flashes take the shot. This at least gives the best chance for nailing the focus, and then it’s simply a numbers game to get a shot with good framing and composition and all the body parts well placed. Of course, I could’ve zoomed out and just cropped to perfection, but this feels a little like cheating – I’d rather put in the time and practice perfecting my game out in the field as much as possible. An occasional clipped antenna, tarsus, etc. now will lead to better results down the line. This entry was posted in Coleoptera, Curculionidae and tagged Argentina, beetles, entomology, insects, nature, photography, science, techniques, weevils. Bookmark the permalink. The 60D’s flip-out screen combined with live-view now allow me to get some of those overhead and other shots that I wouldn’t have been able to get before. My January Costa Rica trip was the first chance to use it, and I took advantage of it more than I would have guessed. I’m a cropper, by the way. Sure, I try to get close to what I’m aiming for in the field, but I don’t sweat it too much. Jealous! No 60D in my foreseeable future. I don’t mind shaving a couple of edges to improve the composition, but I’d just as soon keep the pixels if I can. That must be the sveltest weevil I ever saw! I can honestly say that this is the first time I’ve ever heard the words “sveldt” and “weevil” used in the same sentence! Whether it be svelte or veldt – I fear no weevil! That is a nice photo!